The Labomed TCM 400 Inverted Phase Contrast Microscope is a compact and powerful system with sharp contrast, true color and crisp definition. This lab microscope is outfitted with a binocular head at 30°, with super wide field 10x/22mm eyepieces with rubber eye guards, antifungal coatings. This inverted phase contrast microscope has extra long working distance objectives, and infinited corrected optics, along with a quadruple reverse angle turret nosepiece. The light source of this Inverted Microscope is a 6v-30W halogen lamp that comes with an intensity control, and features a built-in voltage stabilizer. 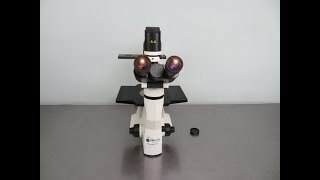 This Labomed TCM 400 Inverted Phase Contrast Microscope has been fully inspected and the optics are clear. All of our lab equipment comes backed with our standard warranty. Should you have any questions, please don't hesitate to contact us.